Photo: View to south of the spillway. Eastern Mojave Vegetation View to south of the spillway. Photograph taken July 7, 2009. This photograph was taken from the little promontory just north of the spillway. I had lunch here, and it could be a place to camp. The uppermost lake sediments can be seen in the approximate center of the photograph. 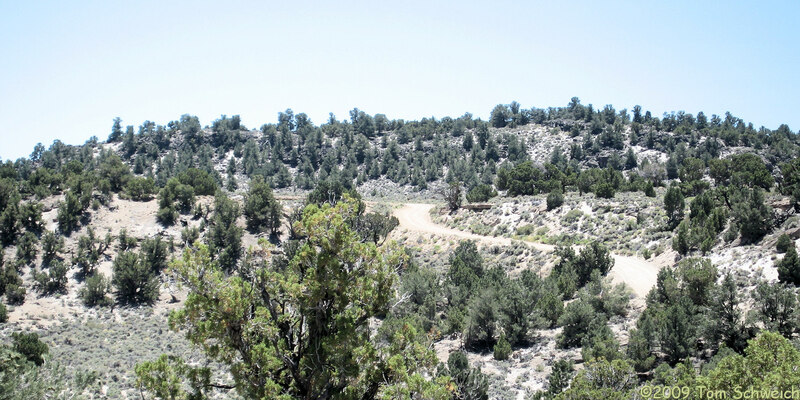 Dobie Meadows Road, Mono County, California: at little road. Field Notes: near Adobe Hills Spillway. A Checklist Flora of the Mono Lake Basin, Mono County, California and Mineral County, Nevada. : at Adobe Hills Spillway. Other photos about Geography - Mono Lake Basin, California or Adobe Hills Spillway.